The CamRanger Camera Mounting Kit from Tether Tools includes the components to safely and securely mount a CamRanger Wireless Transmitter to a DSLR camera for fast and convenient wireless applications. 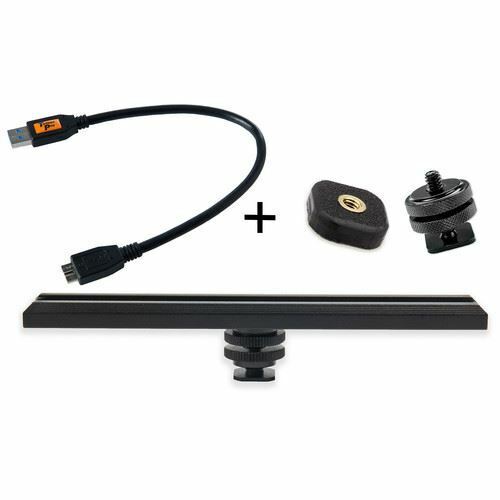 The kit includes the Rock Solid Accessory Extension Bar which can mount multiple devices to a DSLR including the CamRanger which will be held in place securely and in a position to minimize accidental cable disconnection. The Rock Solid Mighty Mount which attaches the CamRanger to the Extension Bar and the Rock Solid Hot Shoe Adapter which fits into the camera's hot shoe mount and provides a 1/4"-20 screw to connect to the Extension Bar. A 1' long USB 3.0 cable is also included to connect the CamRanger to your DSLR. The length of the cable as well as the size and strength of the extension bar and mounts provide the ideal distance between camera and a CamRanger, avoiding dangling cables as well as potential damage caused by impact. This Tether Tools RapidMount Accessory Extension Bar is an 8" extension arm featuring a hot shoe mount with two locking nuts. It also features a removable hot shoe to attach arms or clamps. There is a cold shoe channel and three 1/4"-20 threads for various mounting options. The extension bar is made from aluminum and has a black finish to reduce reflection. Transfer data quickly and reliably with the 1' orange TetherPro USB 3.0 Male Type-A to USB 3.0 Micro-B Cable from Tether Tools. This cable comes with a standard USB Type-A connection that connects to desktops, notebooks, and tablets, and a USB 3.0 micro-B interface is on board to power and transfer data for portable storage drives. The cable is fully shielded to filter out signal noise and reduce transmission errors. USB 3.0 technology provides transfer speeds of up to 5 Gbps when used with compatible devices. Box Dimensions (LxWxH) 1.8 x 1.0 x 0.9"
Box Dimensions (LxWxH) 4.0 x 3.0 x 0.1"
Box Dimensions (LxWxH) 2.0 x 2.0 x 1.0"
Box Dimensions (LxWxH) 7.0 x 3.8 x 0.2"